is a place where you can enjoy good food and drinks or to rest with a cup of espresso or a glass of your favorite wine in a modern, relaxed atmosphere. 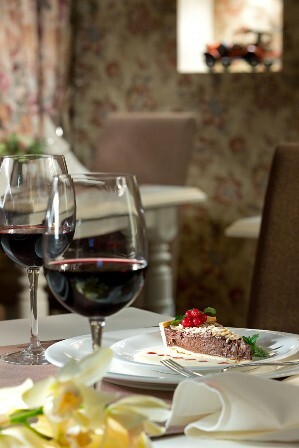 De Gaulle menu offers European and traditional Slavic cuisine. Summer terrace restaurant – the perfect place for a light lunch or a business meeting in the cool shade. There is no better way to start your day than with a breakfast at De Gaulle! Breakfast “buffet” is served from 7:30 until 11:00, includes hot and cold dishes, tea, coffee, juice and homemade cakes. On request breakfast can be served in your room. The restaurant is ideal for business meetings, romantic and family dinners. Enjoy fine cuisine and exceptional standards of service at De Gaulle restaurant!